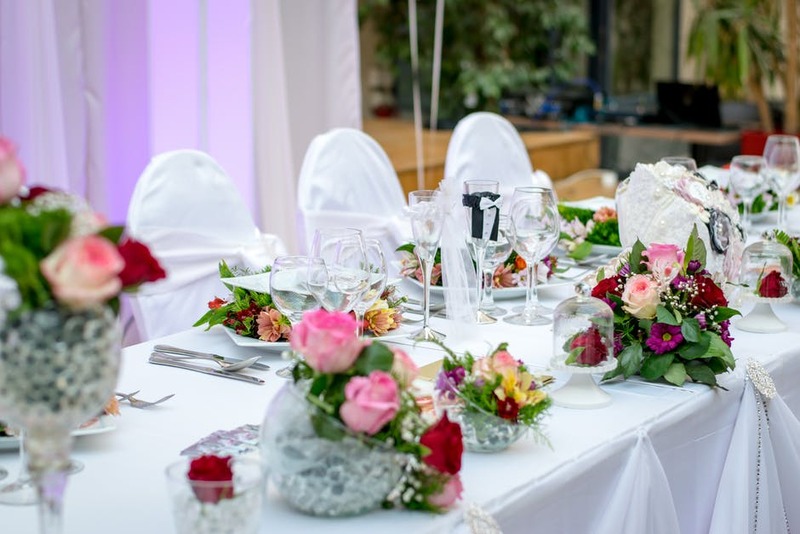 The most obvious fabric used in a wedding is for table and chair covers. But simply draping them over may look boring and unpolished. To make them more interesting, here are a few styles you can try. Start with a simple white tablecloth to drape over your rectangular table. Layer with a round tablecloth. Use a colour that matches your theme and a fabric that contrasts the texture of your white tablecloth. Lay the round tablecloth until it touches the floor. From the centre of the circle, gather the cloth upwards and then use a pin to hold it in place. You can decorate it with a flower arrangement, a ribbon, or any other accessory of your choice. Table runners are classic wedding decoration, especially if you have long tables. The trick to beautiful table runner is to use fabric that adds texture and colour to your tables. You can layer on top of a tablecloth or use it alone to add interest to a simple table. Drape a yard of tulle on top of the back of a chair, and then gather it at the bottom of the back of a chair. Use a twine to tie the tulle together where the two ends meet at the bottom of the back of the chair. You can hide the twine by tying a ribbon around it or decorating the tulle with flowers. You can use these fabric rosettes as part of your centre pieces or to add decorations to table and chair covers. *This project works best if you have a tough fabric like canvas. You can also use two types of fabric (one delicate and one tough) to create some contrast. To start the rosette, hold the strip vertically. Hold one edge of the strip, roll it under, and then fold it down to create a triangle shape. Secure the fabric rolls with fabric glue, and then roll the strip towards the original roll. The original roll is your centre petal. Repeat the folding and rolling process for the rest of the long strip. Make sure that you’re doing it in the same direction that you originally did the centre petal. Once you reach the end of the strip, tuck the edge under and secure it again with the fabric glue. Repeat these steps for the rest of your strips. Note: If you’re using two different types of fabric, cut half-inch strips from both and then attach one strip from each fabric together using fabric glue. Hopefully, these fabric wedding décor ideas have given you inspirations on how you can decorate your wedding venue for the ceremony and reception. If you want to purchase fabric rolls, you can check out Chair Cover Depot.